Today's card was made to fit in with a call for monochromatic cards. I love this Big Eyes Owl, and thought she might look nice in pink. 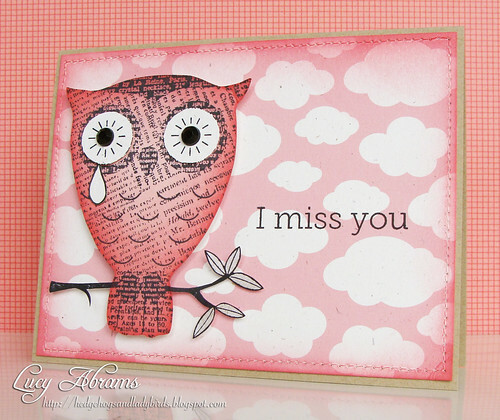 I used Hero Arts cloud background from the Silly Scape digikit, recolouring it to pink and printing on rustic cardstock. Lucy, this is a fantastic card. I can relate to picking pink. :) It's just such a pretty color! Beautiful! I love it too Lucy. I could see this card in any color, green, blue, purple. It might just depend on who you are sending it to and perhaps their favorite color. Love the pink clouds! Don't know why this one was rejected! I ran across your card from 10/16/10 on Pinterest the other day. Is there any way to still get these owls. I couldn't find them on Hero Arts. Thanks for the insightful tips Lucy! I just want to say that I get so excited to get ur blog posts. Your style is so clean and you are so creative. The things you do with the HA kits amaze me! P.S. Pink owls are fabulous. Lucy, I really love this card! Clever to add the tear drop! The pink is such a pretty colour, and I agree with Pauline, this card would work in ANY colour, it's an awesome design!